Ku Ku Connect – Business in the kitchen! For the December Leicestershire Connect Reception we are delighted to be hosted by Sherwin Hall at their brand new luxury showroom Oadby House. Designer kitchens which dreams are made of is what Sherwin Hall delivers, from concept to design, build and installation by talented and friendly in-house team. 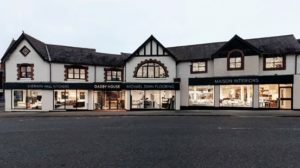 Sherwin Hall use only the finest materials and specialist appliances you cannot purchase on the high street offering both traditional and contemporary kitchens. Sherwin Hall will be serving up a little festive cheer, perfect for a kitchen setting with Christmas themed food and drinks, as well as our usual effective and informal business networking which will be the final Connect Reception of what has been a fantastic year for business connecting. 7colours Photobooths will also join the reception who offer an effective way to capture business events whilst entertaining your guests. 7colours Photobooths who have worked with clients for weddings, parties and corporate events including Belvoir Castle and a launch event with Elizabeth Hurley will be snapping Members and guests at Sherwin Hall’s fab new showroom.